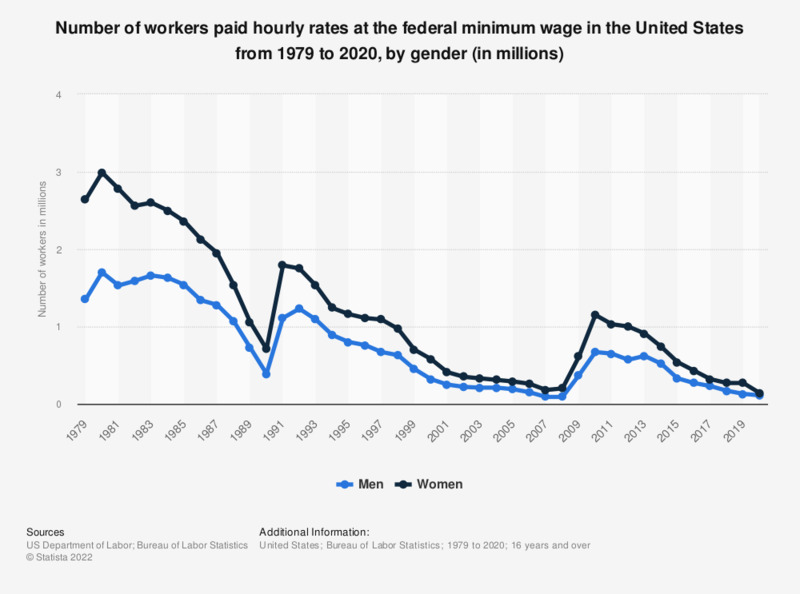 This statistic shows the number of workers paid hourly rates at the federal minimum wage in the United States from 1979 to 2017, by gender. In 2017, there were in total 230 thousand male workers receiving hourly rates at the federal minimum wage. The prevailing Federal minimum wage was $2.90 in 1979, $3.10 in 1980, and $3.35 in 1981–89. The minimum wage rose to $3.80 in April 1990, to $4.25 in April 1991, to $4.75 in October 1996, to $5.15 in September 1997, to $5.85 in July 2007, to $6.55 in July 2008, and to $7.25 in July 2009. The prevailing Federal minimum wage was $7.25 per hour in 2017. Wage and salary workers, excluding incorporated self employed.